Junk (and the DAQ) that we couldn’t fit anywhere else… If your question isn’t answered here, please call Nancy Goodnight at (254) 405-2518 or e-mail her at rockbridgerunner@gmail.com. If she’s not running, she’ll answer… Maybe. So how goes the hill training? When the hay is in the barn, folks, get ready to meet your new favorite race. When you cross the finish line, you will not only have done something worthwhile for your health and your ego (we know who you are), you will have also helped to raise funds for the “Be the Match Registry”, operated by the National Marrow Donor Program, a nonprofit, life-saving organization. You will be able to join the Marrow Donor Registry at any point throughout the weekend if you are between the ages of 18-44 and in general good health (We are betting you are…), providing you the opportunity to give the greatest gift of all, a second chance of life for a desperately ill cancer or blood disorder patient. You have worked hard to get here. We want your race day experience to be a memorable one, and we are doing everything we can to make that happen! What’s the schedule for the weekend? When does everything start? Indian Springs Park, 113 S. University Parks, downtown Waco, Texas. Take the University Parks exit off of I-35 and go .5 miles west towards downtown. You can’t miss it…seriously. Will all the roads be closed to traffic? Almost all roads will have at least one lane open – the only exception is Austin Avenue, which will be completely closed to traffic beginning at 7:00 a.m. Cameron Park will also be closed to traffic beginning at 7:00 a.m. Yes, we have early starts at 5:30 a.m. and 6:30 a.m. Please be aware that you are running/walking at your own risk beyond the course hours of 7:30 a.m. – 4:30 p.m. We will have a sign up at Packet Pick Up. It is your responsibility to submit your bib number at that time or in the morning to the Race Administrator, the Race Director, or the Timing Company BEFORE YOU START. If not, you may run the risk of harm from some dude dressed in a tutu who just PR’ed and placed for the first time ever. We will also be forced to disqualify you. Make sure you turn your name in ahead of time and rest assured we will be at the finish line with your medal and your margarita. Can I follow a runner? How do I get to the start of my relay? We strongly encourage you to provide your own transportation to the relay stations. We do, however, have the Quality Care nursing home van (that’s funny) available to transport relay participants to and from the start line to each exchange station. The shuttle starts its runs at 7:45 a.m. from the corner of University Parks and Franklin Avenue. Just know if you rely on this, you may have to wait a few minutes as it makes the rounds. You can leave your bag at our drop area inside the finisher tent near the start/finish line. Please tag your bag with your name or race number. The area will be supervised by volunteers, but please know the race committee is not responsible for your belongings, just your good time on race day. 1 mile and Miracle Match KIDS races are not timed events. Listen to me now… It’s.For.FUN. 5K – Chip Timed by Redemption Racing from San Antonio. Love those guys! Sunday races – your chip timer will be a disposable one that will be on the back of your bib. So, make sure and keep your bib on – NO CHIP – NO TIME!!!! All participants can expect a party on the bridge; brisket fajitas sponsored by the Texas Beef Council, and beverages sponsored by Glazers, Miller Lite, Coors Light, and the nectar of the gods, Coca Cola. All this keeps the Race Director happy, rest assured. We have food and beverages on Saturday and Sunday. Details on the After Party Page. Yes, we have “adult” beverages. Many of our firefighters are registered EMT’s. We also have an ambulance on hand courtesy of the East Texas EMS. All rest stops have emergency contact numbers – please alert the volunteers if you or another run are in need of aid. The day is looking to be unfortunately a wee bit warm. Plan accordingly – drink early and often, consume salt. Yes, we allow them, but only if you have some Jay Z and Pitbull on your playlist. Seriously, we love running to our music too; we just ask that you be smart and considerate to your fellow athletes. Locations are listed on this page along with info about potty stops and electrolyte gels. Please remember to thank our volunteers, especially if they are dressed like angels or wearing belly dancing costumes in 23 degree weather!! Potty stops are listed along with the water stations and where to get electrolyte gels on this page. Available on the Full Marathon course. Locations are listed at the bottom of the page that also has the water stops and restroom stops. Please take a moment during your run to note the very special mile markers this year. Each mile of the race has been dedicated to a marrow or stem cell donor, recipient, or a patient waiting to find a matched donor. We hope as you run your race, you will think about the true “Miracle Match” represented by each of those individuals. Yes, you know it’s you… share on our FB page, Twitter, Instagram, and use our custom snapchat filter on Race Day. It’s YOUR MOMENT. Share it! The 5K is scheduled for Saturday on race weekend, the same day as the Firetruck Pull and the One Mile Fun Run and Kids Marathon. So you wanna gift your bib to a friend? We will allow this online for an irritation fee of $10.00 until January 1. After that, transfers are still allowed but more expensive… $20. So get your social calendar and your training in order. If it doesn’t work out, then be satisfied you have donated money to a cause that saves lives, the National Marrow Donor Program. Don’t wanna dance with the one you came with? One more beauty of a small race – we can accommodate you and transfer you to a different event. We understand your training and injury level affect your race choice (been there, done that). You may change races online yourself for a $10 fee until race weekend; after that transfers can be done at the registration table at the Packet Pickup area for a $10 fee. Seriously, make up your mind, pull the trigger, and make your changes before race weekend, as Nancy and Debbie cannot handle the stress. We are delicate this way. Can I change to another event after I have registered? Yes, you can change to another event for a $10 fee through race weekend. Transfers on race weekend must be done in person at the registration desk at the event expo. Before race weekend, transfers may be done online or by emailing the race administrator at miraclematch2017@yahoocom. “Stuff Happens”. We know this. It happens to us too. But this is very important, life saving venture. We are out here to cure cancer and other blood related diseases. So consider your race fee a charitable donation to one of the greatest things on earth. We will even give you a tax deduction and a big kiss. And welcome you back next year. Thank you for understanding how important the Miracle Match Mission is!!!! What do you use for timing? Your timing device is disposable and attached to your bib. Just make sure you wear it on the front or risk looking like an amateur… If you miss this one, no worries. We promise to only make fun of you when you are not looking. Where do I get my finisher’s swag? At the finish line. Wear it with pride. For a week. Okay, a month, a year…maybe two. Yes. If you plan to drink the kool-aid (the adult kind, that is), please bring your photo ID. Everyone looks old after running 26.2 miles of hills, so we have to be sure and reserve the rights to card even your grandmother. Can my wife / girlfriend / Cousin Vinny eat at the afterparty? Yes. However, if athletic supporters wish to partake, we suggest a donation to the Finishers Garden, maybe $15 per person. This is necessary to help cover our costs and put more people on the Registry. And quite honestly, it’s a bargain! How can my organization participate in the KIDS Marathon? Yes, you can help build/mentor a team as well as sponsor kids who cannot afford the $12 fee. These are the very kids who benefit the most from our program. Let’s work together to make every child a Miracle Match Kid, regardless of the socioeconomic status. Call Rhiannon Settles at 254-749-1307 or e-mail runnerrhi@gmail.com. More details and Forms for the Kids Marathon. How an I have my Age Group Award medal mailed to me? If you win your age group for the marathon, half marathon, 10K or 5K and do not want to stay for the awards ceremony, we will be happy to mail your award for a cost of $5 for shipping and handling (plus processing fee.) 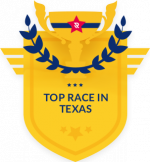 Go to https://runsignup.com/Race/TX/Waco/MiracleMatchAwardsShipping. Medals will only be available to be mailed until April 1st.